Scientists have recently analyzed fossils they excavated from southwest China in 2009, and their findings show some interesting information on the evolution of the modern fish. Interestingly enough this new fossil discovered is said to be from 235 million to 242 million years ago, and not at all related to the modern day flying fish. So how can this fossil teach us anything about the evolution of our modern day flying fish? It’s simple, these species, although perhaps not related, are fairly similar in their functions and therefore can easily be compared and used for knowledge of the other. The newly found fossil is extremely well preserved and can be analyzed quite accurately. One reason scientists are able to identify this prehistoric fish as a gliding creature are its “unusual combination of morphological features” associated with gliding strategy in fish and was capable of gliding just like modern flying fish. For instance, its front fins are fairly enlarged, just as our modern day flying fish, and very likely would have been used to glide outside the water. Its tail was also “deeply forked” just as our modern day fish and due to the way the muscles configurate, could easily be able to generate the power necessary to launch the fish out of the water. These specific traits help scientists and researchers to identify the fishes innate ability to glide out of the water. Besides looking really cool, flying out of the water does serve a practical purpose too and scientists believe that the ability evolved to escape underwater predators in both the 240 million year old fish and our modern day flying fish. We can also make many a few other assumptions when regarding this species of flying fish when we compare it to the modern day one. 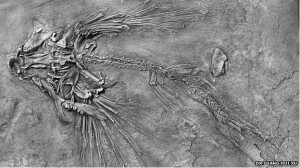 For example, researcher Guang-Hui Xu, a paleontologist at China’s Institute of Vertebrate Paleontology and Paleoanthropology in Beijing, said regarding the fossil that “In modern ecosystems, due to limitations of muscle function, flying fishes are unlikely capable of flight at temperatures below 20 degrees C (68 degrees F). We can reasonably apply similar limitations to the Triassic thoracopterids, and we suggest that Potanichthys adds a new datum supporting a generally hot climate in the Middle Triassic eastern Paleotethys Ocean.” So through this discovery of the prehistoric fish we have made perhaps even more important discoveries of climate during this time period. The flying fish is a truly unique creature that still poses many unanswered questions. Its incredible gliding ability is one that can easily generate awe and are capable of gliding through the air as fast as 1,300 feet in 30 seconds, with a maximum flight speed of up to about 45 mph. Through this discovery of an earlier flying fish it helps to confirm that all of this acts as a function to help escape predators in the sea and can help to give us information on life from 240 million years ago. 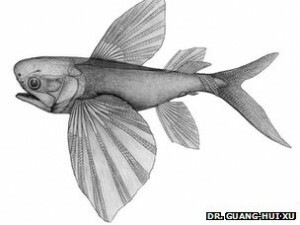 New flying fish fossils discovered in China, BBC Nature News, 31 October 2012. What is most interesting about this discovery, is how the scientists were able to make a comparison of the morphology of the fossil fish and modern-day flying fish, and conclude something about the climate back in the Triassic! That’s just too cool.